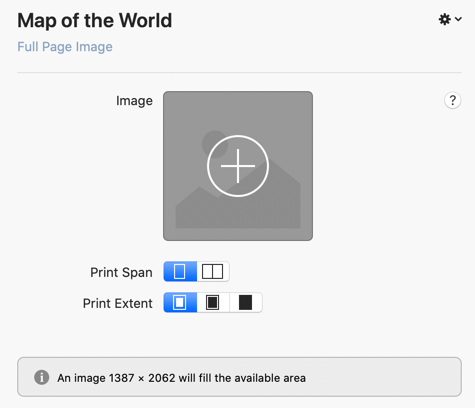 A Full Page Image displays a single image — such as a map — on one page. It can also be used for other applications, like creating a custom title page for your book. To add a Full Page Image to your book, select Full Page Image from the menu in Chapter ▸ Add Element. More details about adding elements can be found in Elements of Your Book. To choose the image that will be displayed, press the + button in the editor. 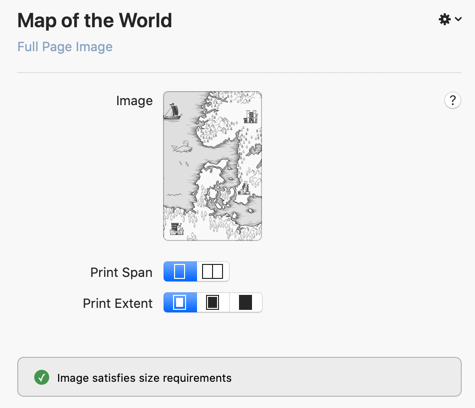 When you’ve selected an image, Vellum will show you a thumbnail version of the image and indicate whether your image is large enough to fill the page. You can remove the image by clicking with the Option key held down.